About 250 million years ago, during the Triassic period, a hot and arid desert that we now know as the often grey and damp island of Ireland rested about 15 to 20 degrees north of the equator — approximately where Sudan is today. In the desert heat, large areas of salt water evaporated, forming a layer of mudstone that would become the first strata upon which the dramatic, undulating topography of the Belfast hills would rise. 150 million years later, sea levels had risen and the calcium rich waters were full of algae known as coccolithophore. When dead their calcite skeletons settled on the seabed, over millions of years forming a seam of limestone that now weaves its way along the slopes of Belfast’s hills. Just under 100 million years later archeological evidence tells us that the first settlers of Béal Feirste inhabited these hills. Like most of Éireann and the west coast of Great Britain these settlers would have spoken Gaeilge, a primitive form of what by the 17th century would become modern Irish, which by the 21st century — with around 6% of the population speaking Irish as a second language — has become an important part of the conversation about a future of shared cultures in Northern Ireland. Today, residential streets weave their way from the Bóthar na bhFál (Falls Road), along the contours of Divis Mountain’s lower slopes, ending where the incline becomes too great, or the limestone rock impenetrable. 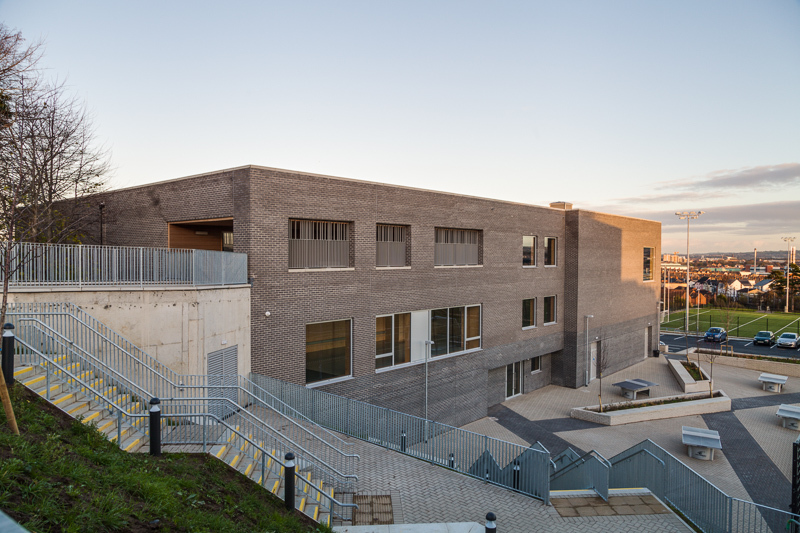 Just off the Whiterock road — taking its name from the prehistoric ground on which it sits — is ARdMackel’s new gaelscoil building for Coláiste Feirste; the only secondary-level, Irish-medium school in Belfast; an important addition to the surrounding Cheathrú Ghaeltachta (Gaeltacht Quarter). The dramatic site steps up from the Bóthar na bhFál towards Beechmount house; built in the 1700’s as the home of the wealthy Riddle family — the oldest unmodified house of its kind in the city. Across the forecourt from the house, cut into the hillside, sits ARdMackel’s new building. A section of existing retaining wall has been pushed back as far as the Limestone permits allowing the building to connect with its prehistoric, geographical past and the ancient inhabitants who walked its slopes, speaking the earliest form of the language it now promotes. “We wanted to connect with the white rock seam,” Ciarán Mackel tells me. “It was important for us that the building was rooted in something of the history that surrounds it — its place and community.” The dramatic views from the site connect the building back to the city: “we wanted the students to be reminded that Belfast is a shared city, that this is their city too.” A building as symbolically important as this deserves its place at the top of a hill. Place and community are important for Mackel; “it’s why I decided to pursue architecture as a career.” His father, Seán Mackel, an architect, community activist and one of the founding members of the Irish language movement in the north became a role model for Ciarán. “He worked all of his life, mostly pro bono for the construction of Belfast’s first Gaeltacht at Bóthar Seoighe (Shaws Rd)” and following the events of 1969 “he was involved in the rebuilding of Bombay street” recalls Mackel, who, with others from the community, helped dig the footings for the new houses. A few hundred yards from Coláiste Feirste, is Gael-Ionad Mhic Goill, a new state of the art Irish language centre, named after Seán Mackel. The limited budget meant that ARdMackel had to work hard to produce what is a simple but accomplished building. Where less experienced architects might have been tempted by investing large portions of the budget on instagramable front-facadism, ARdMackel spent the slim, 2.5 million pound budget carefully, throughout the whole building. The simple and economical plan orientates the various programs — two sports halls; classroom; gym; changing facilities and the necessary admin and plant — around a generous central corridor with vertical circulation at either end. Externally, the uncluttered elevations use a simple pallet of two brick tones punctuated by generous openings, which from the inside frame the spectacular views across the site. Internally the brightly coloured, green rubber flooring and yellow painted window frames compliment the muted tones of exposed concrete, timber-lined window reveals and laminated ply cladding. The engineered timber roof structure of the main sports hall zigzags across the ceiling, following the geometry of the external landscaping. This remarkably simple but effective move, when seen from the viewing platform, creates an interesting illusion of space, in what — for obvious reasons — is required to be nothing more than a simple rectangular box.